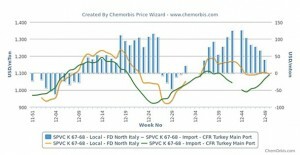 Local PVC prices in Italy have sustained their softening trend in December, although other products, namely PP and PE, have shrugged off the bearish trend regardless of the lower monomer costs in the region, as per the pricing service of ChemOrbis. The ongoing weakness of the PVC market in Italy is also defying the global upturn, which has been in place since mid November in the nearby Turkish market. This situation has caused Italy’s local PVC market to lose its traditional premium over the rest of the globe. 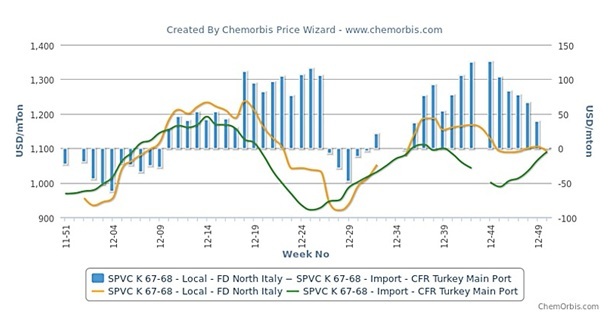 Comparing Turkey’s average import PVC k67 range for European and US origins (including customs duties if applicable) on CFR basis with Italy’s average local k67 range, the premium has neared zero as of this week, as can be seen from the graph below created by ChemOrbis Price Wizard. A similar situation was in place the last time in July and early August, when Italy was trading at a discount when compared to Turkey and this was followed by higher prices in September after players returned from summer holidays. European PVC offers, which are one of the main sources of supply for Turkey, have been rising in the past few weeks with the recent k67 offers touching the $1100/ton threshold on CFR Turkey, cash basis. When converted to the euro with the 1.30 parity, it corresponds to €846/ton, which is way above the low end of the current local market range for k67 in Italy. PVC offers from an official distributor of a West European producer are forming the low end of the overall k67 range in Italy. He informed that they have finished their deals this week with €20/ton decreases from last month. “We have had to apply these discounts in order to generate some demand and make some sales.” According to the distributor, the outlook is foggy for January with some buyers pre-buying ahead of the possible January hikes while others are expecting rollovers and they keep their stocks low. Purchasing some cargoes at the low end of the k67 range, a pipe manufacturer also told ChemOrbis, “We feel that firmer prices are on the horizon as was the case in January 2012, even though there are some opposing views in the market.” He also highlighted that the construction sector has been showing a really bad performance, which results in consistently low demand. “We hope to see a pick-up in the months ahead,” he commented. Indeed, the weak stance of the PVC market may really be attributed to the poor economic conditions of the country as PVC is the most sensitive to economic developments. The Italian economy shrank by 0.2% in the third quarter from the second quarter, when it decreased a revised 0.7%, according to the announcement of the National Statistics Institute Istat in November. Another economic indicator, the industrial output index, was revealed early this week showing a decrease of 1.1% in October when compared to September while the confidence index for November in the Italian construction sector declined 1.72% month over month after a stronger month on month fall of 5.45% in October.